MET-Rx Creatine powder features pure creatine monohydrate, a scientifically researched and tested nutrient. Creatine monohydrate is widely considered one of the best sources of creatine because it contains a high percentage of pure creatine per weight of material. 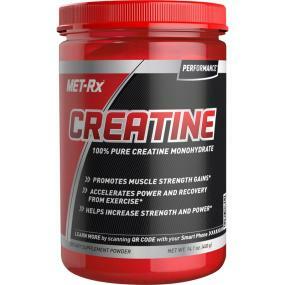 Creatine helps promote performance and is especially good during short-term, high-intensity exercise. * Fueling your diet with creatine also helps increase muscle strength and power.